The point of Fran is to sprint through the entire workout. You do 21-15-9 of thrusters and pull ups and when you're done you feel like it. You feel like you just ran the New York marathon. But because it takes into account strength and endurance, it is a great workout to measure your results against. 8 weeks ago I tried to handle Fran and did not do a fantastic job of it. The weight I chose was 65lbs and it took me 14:02 to complete the workout. (for comparison, the record at our box is 2:13 at 95lbs). Today I pushed myself a bit more by upping the weight to 85lbs. It hurt. It hurt even more because we did seven 100m sprints 3 minutes before starting Fran. I had a goal in my head of 12 minutes. Not a great time by any stretch of the imagination, but it would have been a great improvement to knock off time while increasing my weight. The workout started and I immediately felt it in my legs, I though I could do 21 unbroken, but that just was not the case..I got 12 and had to drop the bar. The pull-ups just about killed me. I was hurting but I finished the first round in about 4 minutes. I don't remember much about the middle round other than to keep breathing and to not puke. 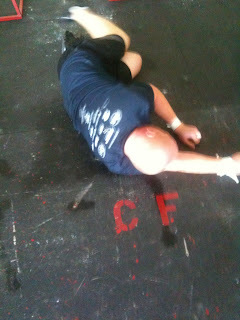 In the final round I was able to get through the thrusters, but then the pull-ups just killed. I did 3 to start then I had to do them solo. Not a positive. I completed the entire workout in 10:12, which was much better than my goal! Still not a great time, but next time I do this workout (likely in early October) I will do it prescribed and hopefully will be around the 9 minute time frame. So below are the accurate before and after statistics. I'll try to get the before and after photos soon and have them in this post. Although the statistics are nice to report, what I care about is how I feel and I'm happy to report that I feel wonderful. I have yet to get tired of a crossfit workout and even find myself making time to go. My diet is under control and although I'm not keeping track of points for a contest anymore...I am not veering from my semi-paleo pallet. I actually love the way the "diet" is set up. It works...FOR ME. I am also VERY happy to report that Karen (digital mustard) won the box contest for the most weight lost in the 8 week period! She lost 8.17% of her weight! She has stuck with the program for 16 weeks now and is still working hard! I can see her confidence starting to peek through now as she moves more into some of the strength. really? You didn't read anything above did you? Scroll back up and start from the beginning..all the WOD information is in there.